This seven-day self-drive tour will take you on an incredible odyssey, through some of Iceland's most magical sights, making it ideal for anyone who wants to get a true taste of the land of fire and ice. We take care of all the logistics: booking accommodation, arranging a rental car and organizing a detailed itinerary, allowing you to enjoy your journey through some of Iceland's most incredible landscapes. Optional Extra: If your flight schedule allows, you can stop at the famous Blue Lagoon geothermal spa on your way to the airport on day 7, for a relaxing swim. The admission fee is not included and a pre-booking is required. We recommend you do so on bluelagoon.com. Remember to bring a bathing suit and a towel, if you don’t you will need to rent or hire them. This trip will take you across the length and breadth of the country, encompassing 1,333 kilometers of diverse landscapes and stunning natural wonders. It is an awe-inspiring journey that will take you through a world that has been crafted by the capricious rage of volcanoes and the icy forces of glaciers. This incredible journey will take you through Iceland’s ever-changing, volcanically crafted landscape: from stunning black sand beaches, idyllic fishing villages, regal cascading waterfalls, bubbling hot springs, rolling meadows, imperious glaciers and much, much more. It is ideal for people who want to explore the land of fire and ice at their own pace, stopping at the places that interest them and enjoying a plethora of natural wonders in a myriad of spectacular locations. It will take you to some of the most unique places in the world, making it a one of a kind trip that will remain with you for the rest of your life. We take care of all the logistics, booking everything from your accommodation to your rental car, allowing you to get on the road and discover all the sublime sights that Iceland has to offer. The tour begins, when you arrive at Keflavik International Airport, where you can collect your rental car from a member of our friendly staff and immediately hit the road. We recommend that you try to land as early as possible, in order to maximize the amount of time that you have in Iceland. If you arrive later in the day, we recommend you arrange accommodation in Reykjavik for that evening and then you can hit the road nice and early the next morning. The first destination on the trip is the iconic Golden Circle route, an absolute must for all visitors to the country. It encompasses a plethora of amazing sights, including the historic and geologically significant Thingvellir National Park, the geothermal wonderland of the Geysir hot spring area and the magnificent Gullfoss Waterfall, which is famous for the stunning golden hue that its water takes as it tumbles down a petrified lava step. The first stop on the route is Thingvellir National Park, a UNESCO World Heritage Site that is steeped in both historical and geological significance. It was the founding spot of Althingi, the oldest continuously running national parliament in the world. It was originally founded in 930 AD when a group of Viking nobles got together to elect a leader, the actual Icelandic parliament has since moved to a building in Reykjavik, however, it still bears the same name. Thingvellir also straddles the North Atlantic Ridge that separates the North American and Eurasian tectonic plates, which are moving apart at a rate of 2 cm each year. This along with a plethora of incredible rock formations and the sapphire world of the Silfra Fissure, where it is possible to snorkel in between the tectonic plates. Thingvellir is followed by the incredible Geysir geothermal area, home to the now dormant Great Geysir, which is where the English name geyser is derived from. You will find its still active younger brother Strokkur, which throws jets of boiling hot water up to 30 meters into the air every 4 to 10 minutes. It is one of the most iconic places in all of Iceland and will give you a profound new sense of the power of nature. The final stop on the tour is the majestic Gullfoss Waterfall (golden falls), where a roaring cascade of water vaults down three separate lava steps into a luscious green valley below. It gets its name from the golden hue that the water takes as it passes over the brown volcanic rocks. On sunny days it is especially photogenic, with rainbows commonly appearing over the falls. If you arrive early or want to cram even more fabulous activities into the day, then you could book one of our snowmobile tours, which depart from the café at Gullfoss and take you to the vast icy wilderness of the Langjokull Glacier: an unforgettable and adrenaline-pumping experience that will remain with you forever. (Please note that the snowmobile tour lasts 4 hours, so it is vital that you arrive early in the day). Another option is the beautiful Faxi Waterfall, a wide and shallow fall that stretches a full 80 meters across the breadth of the Tungufljót River. We will arrange accommodation somewhere along the Golden Circle Route, including the villages of Selfoss, Hella, and Hvolsvöllur, allowing you to wake up and head straight to the next day’s adventures. The world's most impressive road trip? We like to think so! The second day of your Icelandic odyssey will take you to its famous South Coast, populated by majestic waterfalls, glimmering glacial lagoons, and dark volcanic beaches. It stretches all the way from Reykjavik to Jökulsárlón and will take you through a myriad of natural wonders that are guaranteed to take your breath away. Your first stop will be the magnificent Seljalandsfoss, where a cylindrical stream of white-crested water vaults 60-meters over a volcanic cliff-face into a pool below. This is framed by the mighty Eyjafjöll Mountains, making it an even more beautiful scene. Seljalandsfoss is also totally unique due to the small cave that is hidden behind the waterfall, allowing visitors to walk behind the stream and view it from a completely different angle. If you are looking for something a bit further off the beaten track, then the nearby Gljúfrabúi waterfall is perfect for you. It is contained within a sheer canyon, meaning that it is more difficult to find, although its beauty makes it well worth the effort. The final must-see waterfall along Iceland’s South Coast is the spectacular Skogafoss, famed for its gushing torrent of water, which dives 60-meters down into a shallow pool below. There is a winding path that runs up the hill next to the waterfall, allowing visitors to climb to the top and enjoy a stunning vista of the surrounding area. Skogafoss also appears in Icelandic folklore, thanks to the two strange rock formations, which locals believe are petrified trolls who were so enchanted by the beauty of the falls that they forgot about the sun. Your next incredible adventure will take place on the iconic Sólheimajökull Glacier: a crevice ridden wilderness, replete with pristine snow and majestic scenery. Once you arrive at our base (at 13:30) at the foot of Sólheimajökull, your friendly guide will provide you with all the equipment that you need and give you a quick safety briefing. Then we will head out for an adrenaline-pumping, three-hour, glacial hike, an unforgettable experience that is a must for everyone that visits the land of ice and fire. After that, you will head for the Dyrhólaey Cliffs, a nesting ground for many of Iceland’s bird species, including adorable puffins and many, many more. This makes it ideal for nature lovers, although visitors should note that the cliffs are closed during the height of nesting season, to allow the birds to have some peace and quiet (this happened between the 8th of May and the 25th of June last year, although times and dates may vary). From there you should travel to the exquisitely beautiful Reynisfjara Beach, where the white-crested waves of the Atlantic Ocean provide a stark contrast to the foreboding black sands. This scene is framed by a system of basalt columns, which are magnificently beautiful and are Iceland’s version of the Giant’s Causeway. Your final stop will be the picturesque village of Vik, famed for its beautiful red church that offers a panoramic view of the South Coast and surrounding area. We will arrange accommodation for you near Vík, Skógar or Kirkjubæjarklaustur, the perfect place to end a busy day. The first destination on day three is the beautiful Skaftafell National Park. Your drive to it will take you past the massive Eldhraun lava field, which was created by a massive volcanic eruption in the late 18th century. Skaftafell is renowned for the diversity of its flora and fauna. It also plays host to the Svartifoss Waterfall, where a torrent of gushing water, falls in between amazing basalt columns into a gorgeous valley below. There are a large number of hiking paths dotted around the area, making it ideal for those who want to get out and about and explore nature. It is contained within the larger Vatnajökull National park, which is the largest in Europe and covers 12,000 kilometers. It is dominated by the mighty Vatnajökull Glacier, which is the largest in the entire of Europe and is a spectacular sight that everyone is bound to enjoy. It also plays host to the magnificent Jökulsárlón Glacier Lagoon, where shimmering icebergs glide across the icy blue surface of the lagoon. They come to rest on the aptly named Diamond Beach, where the sparkling icebergs provide a stark contrast to the jet-black volcanic sands. This makes it incredibly photogenic and an incredible experience that all visitors are bound to appreciate. The Diamond Beach is also the perfect spot for those who want to watch the Northern Lights, which can be seen from September to April and is a truly profound and powerful experience that words really cannot describe. We will arrange accommodation for you near the rustic village of Höfn. Day four will take you to Iceland’s Eastfjords which combine spectacular mountain scenery with gorgeous blue lagoons. The day begins in the idyllic fishing village of Hofn, which offers stunning views of the mighty Vestrahorn Mountain (West Horn). Vestrahorn stands 454 meters above a beautiful fjord, has a truly unique shape and is made of gabbro and granophyre rocks, making it incredibly photogenic. Next to it lies the ‘Batman mountain', so named because its three peaks are reminiscent of the Batman symbol. The road will then take you northwards along the East Coast, passing by a myriad of crystalline fjords, replete with amazing wildlife and gorgeous natural scenery. We recommend that you pause for lunch at the picturesque fishing village of Djúpivogur, which is surrounded by beautiful fjords and framed by the pyramid-shaped Búlandstindur Mountain. The next stop on the tour is the town of Stöðvarfjörður, which is also rimmed by a series of imposing mountains and is famous for its exquisite natural beauty. There is a multitude of waterfalls that are fed by the Stödvará River and cascade down the cliff face into the ocean below. To the north of the fjord is ‘Saxa’ a bubbling sea geyser that fires torrents of water up into the air. The town also plays host to the collection of Petra Sveinsdottir, a local woman who has spent her life collecting interesting minerals and rocks that are found in the surrounding area. This incredible collection is on public display and is an absolute must for anyone in the area. If you travel slightly further north, you will find yourself in the Hallormsstaðaskógur Forest, a large 2300-hectare area of woodland, which is the largest in Iceland. It contains more than 60 different species of trees and hides a host of hiking trails and paths, which are ideal for people who love to explore nature. The road continues to Hengifoss a colossal waterfall that measures an impressive 128 meters, where a narrow stream of water tumbles down over a series of colorful lava steps into a picturesque gorge below. It is ideal for anyone interested in geology, as the various lava steps represent different geological periods, such as the Tertiary. The hike to Hengifoss takes just under an hour and will take you past a smaller waterfall called Litlanesfoss on the way. It stands 30-meters high and is equally beautiful, thanks to its incredible system of symmetrical basalt columns. We will arrange accommodation for you in either Egilsstaðir or the Eastfjords area. Day five’s adventure starts with Dettifoss, the most powerful waterfall in the entire of Europe, where a roaring torrent of water crashes over a cliff-edge at 500 cubic meters per second. It is nicknamed the beast and more than lives up to its nickname, making it the perfect place to pause and appreciate the awesome power of mother nature. We recommend taking the short 45-minute hike to the gorgeous Stóra-Víti crater, which was hewn into the earth by a massive volcanic eruption in 1724. The crater has since filled with sapphire water, making it a truly splendid sight that everyone is bound to appreciate. Once you are back on the road, you will see the imperious Krafla Volcano, which is close to the hot spring area known as Hverarönd. It is populated by a myriad of fumaroles and bubbling mud pools, where wispy plumes of steam rise into the air. It is a completely otherworldly landscape is devoid of life because the large sulfur deposits prevent any vegetation from growing. This along with the mighty Mount Namafjall and the many incredible geological wonders makes it an experience that is sure to remain with you for the rest of your life. Your next stop will be the idyllic volcanic Lake Myvatn, where plumes of steam rise up from the bubbling geothermal waters. Close to it is a small lava cave, known as Grjótagjá, which is famous for its majestic natural beauty and its volcanically heated waters. It will be familiar to fans of HBO’s Game of Thrones series, as the location of the scene where Jon Snow breaks his vows with Ygritte. Lake Myvatn and the surrounding area is a place of sublime natural beauty, replete with more than 50 small islets and many different bird species swooping overhead. Your penultimate stop will be the iconic Dimmuborgir (dark fortress) a unique set of giant lava formations that were created by volcanic eruptions 2300 years ago. Their nickname derives from their imposing appearance, which is centered around Kirkjan (the church), the best known of the formations. Your final stop will be the majestic Goðafoss Waterfall (the waterfall of the gods), where a wide stream of cascading water tumbles into an emerald green valley below. It gets its name from its link to Iceland’s Christian history, when Thorgeir, the lawspeaker of the Icelandic Parliament, cast his pagan statues into the waterfall below and converted to Christianity. Your accommodation for the night will be in or around Akureyri, which is the second biggest city in Iceland and the capital of its northern region. This makes it perfect for people who want to enjoy the cities vibrant nightlife. Goðafoss waterfall - "The waterfall of the Gods"
The first stop on day 6 is Dalvik, a small village that has views across the stunning Eyjafjordur, a gorgeous destination famed for its imposing mountains, navy blue waters and amazing marine life. There you will join one of our amazing whale watching tours, where we go in search of some of the most incredible marine species on the planet. The most famous of these is the giant humpback whale, famous for their spectacular breaches. The tours themselves, have a 99% success rate, meaning that you are virtually guaranteed to see some form of whale species, which may include: white-beaked dolphins, minke whales, and small harbor porpoises. Killer whales and Blue whales are occasionally seen in the area, meaning that it is possible that we will see the largest creature to ever exist on planet earth! Getting up close and personal with these gentle giants of the deep is a truly unforgettable experience that is bound to remain with you for the rest of your life. Once you return to dry land and get back on the road, you will pass the famous Skagafjörður fjord, which is steeped in history and culture. There are three islands hidden within its waters, the most famous being Drangey, which is shaped like a fort and plays host to a myriad of different bird species, including adorable puffins and guillemot. Your route back to the Icelandic capital will take you through the heart of Iceland’s green countryside, where you will find many horses and animals that you can photograph and appreciate. The ring road also passes the impressive Grabrok Crater, a scar from a vicious volcanic eruption that occurred around 3400 years ago. The final stop of the tour is Reykjavik, a welcome return to civilization after an adventure filled week in the Icelandic wilderness. We strongly recommend that you enjoy the city’s vibrant night-time scene, which can be found in its many delicious restaurants and trendy bars. We will arrange a hotel somewhere in the capital region: Reykjavík, Kópavogur or Hafnarfjörður. 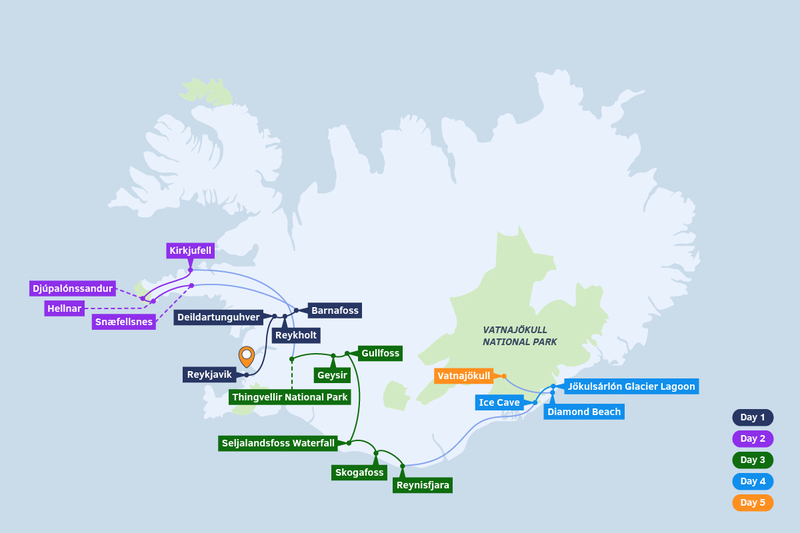 The final day of your Icelandic adventure will take place in the Reykjanes area, which is filled with a multitude of amazing sights that you are bound to enjoy. No trip there would be complete without a rejuvenating soak in Iceland’s iconic blue lagoon. It is nestled in the heart of an 800-year-old lava field and filled with milky, turquoise water that is geothermally heated to between 38 and 40 degrees and incredibly nutrient-rich. Local doctors regularly prescribe a trip there for people with skin issues. This combined with its truly incredible natural scenery and its temperate waters makes it the ideal place to kick back and relax after an adventure filled week. The lagoon is located close to Keflavik International Airport, making it ideal for people with an early flight. We recommend booking tickets in advance, to ensure that you are not disappointed on the day. Other places close to the airport, include the Hopsnes Peninsula, which was formed by a volcanic eruption that happened around 2800 years ago. There is a small lighthouse and several shipwrecks of trawlers that didn't make it back safe to the otherwise sheltered harbor of Grindavík, one of the busiest harbors in Iceland. Further along Reykjanes Peninsula is the lonely Reykjanesviti Lighthouse that rises 69 meters above sea level and is surrounded by incredible natural scenery. You could also go to Sandvik, which lies in the heart of the Mid Atlantic Ridge and plays host to the ‘Bridge between the Continents’: a 15-meter bridge that allows you to walk between North America and Europe. Be sure to take a certificate from the Reykjanes Information Centre, the perfect souvenir for anyone who wants a memento of their trip.